KENNING EDITIONS is a not-for-profit venture and accepts monetary contributions. 1 – When did Kenning Editions first start? How have your original goals as a publisher shifted since you started, if at all? And what have you learned through the process? 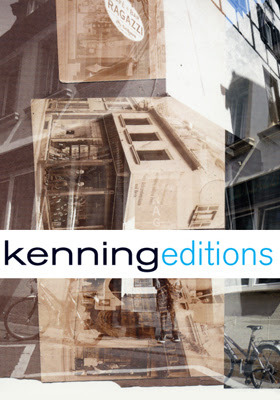 Kenning Editions began in 1998 as a journal, which I published usually in spring, summer, and winter. Eleven issues plus two chapbooks, the first being K. Silem Mohammad's first book Hovercraft, and the second being a poets theater collaboration between Barbara Guest and Kevin Killian entitled Often. Once the journal had played itself out, I published a batch of chapbooks and ephemera, including a few titles under the "No Press" imprint (there is now another such No Press, unrelated). In 2006 I devoted my efforts to producing durable, offset paperback books. My original goals have shifted less than other, more important things, like method. I set out with the hypothesis that continuing to explore the ways contemporary writers were exploiting radical modernist techniques would yield insight into the relationships between literary production and civic discourse. These relationships shift more than anything. I guess that's the lesson. I was involved with underground and independent music and fanzine culture before I became involved in literary publishing. I think editing is a kind of listening. Small publishing is a broad category. I'm not sure what that means in the context of this questionnaire, exactly, because, on one hand, print culture has undergone several important changes since I became involved, and the platforms for circulating poetry I find of interest have proliferated and diverged such that, as a matter of degree, that kind of enterprise is able to shrink to service very specific projects. This is good, but I question whether as many editors are exploiting the opportunity. In some ways, the opposite is true and platforms, missions, critical values are less frequently articulated. The creative writing industry has benefited from the fragmentation of literary publishing, especially, being able to reciprocate with credentializing organs and even the promise of careers. I publish because I am thinking through aesthetics, politics, various problems, and I never can do it alone. My standard contract stipulates that I will not edit the text in any way, leaving the author to engage me as they see fit without being obliged to take advice. I do not understand the expectation that the actual composition of a work should be approved in the same capacity as publishing it. Small Press Distribution is my distributor and I love them. Print runs range from 200-2000. I am transforming Kenning Editions into a non-profit corporation and I gathered a board of directors whose editorial advice--in terms of acquisitions--I trust. I think of myself as the series editor, and then I sometimes work with editors on specific projects, such as Kevin Killian and David Brazil, coeditors of The Kenning Anthology of Poets Theater: 1945-1985. I have always done both simultaneously, so I don't perceive a change, really. It is true, though, that I never write without the work's circulation in mind. I edited Hannah Weiner's Open House for Kenning Editions. And now my poets theater script PQRS has just come out. To me these aren't self-published, because what matters is the capacity in which the work is done. I understand self-publishing as a gesture, and I have done it (under no imprint). But doing these two books with Kenning Editions was for me a practical matter in every respect. Years ago, I was influenced by mail art and fanzine culture. But at this point, I am trying to translate something like what Dischord Records had done in releasing Minor Threat and Fugazi records. It is only logical to align the writing, editing, design, publishing, promotion, and distribution. It is simply the most efficient way for me, a writer slow, as though averse, to finish a project. And like Dischord, Kenning Editions represents a community and is not at all a matter of "vanity." Quite the opposite. From time to time, I can contribute to it in terms of the actual discourse, rather than solely the circuitry. If it were obvious that the press were the right venue for a project, who would know better? 11– How do you see Kenning Editions evolving? As a non-profit, I hope to strengthen present interests, such as archival projects and acts of "recuperation," pursue much more work in translation, and better outreach via a radically revamped online presence. I will, of course, explore grant writing and partnerships with institutions that can facilitate this. I am not a proud person, but I still marvel at the poets theater anthology as a clerical feat. All people who bought other things when they could have bought a Kenning Editions book have overlooked something about themselves. My biggest frustration is all of these people. Most directly, Floating Bear. The first issue of Kenning took a signal of permission from a copy of Floating Bear under glass in the Beat Culture and the New America exhibit circa 1996. Then there were a handful of presses that I could more or less count on, such as Sun and Moon, Roof, O Books. 14– How does Kenning Editions work to engage with your immediate literary community, and community at large? What journals or presses do you see Kenning Editions in dialogue with? How important do you see those dialogues, those conversations? Literary community is wholly imagined, and often presses lend a material substrate to the imagination thereof, though much more effective are the private and apparently ephemeral bases in parties, readings, etc. I think a press can serve community by demonstrating that there is a difference between projects and institutions, though I am still determining how to discern this difference. Yes. They serve a particular title, or they don't. In 2007 I took a batch of Kenning authors on a short reading tour of the west coast, from Vancouver to Los Angeles, and Dolores Dorantes was along. We worked some bilingual variations on Hannah Weiner's "Romeo and Juliette" for performance along the way, and this really started to inform my sense of what was drawing me to publish the range of work we were doing at that point. In 1998 I organized a benefit for the journal in San Francisco--there was another in New York some years later--and many small presses donated merchandise for a raffle, etc. Friends ran the thing, donated their labor and material support. This sort of thing is probably transposed to Kickstarter now, in terms of how one registers affinity. There is a lot of voyeurism there, I suspect, like a donor's circle plaque in virtual space. (I haven't done Kickstarter yet.) I think we can learn more by being in the same room. And I should know. Living in the Midwest, I couldn't afford to attend either benefit event. This sort of thing, for one. I commission books or request manuscripts for consideration based on something more appreciable and less clerical than submission and award. I never want competition to enter in any remote sense, because I am convinced that it not only fails to reveal merit but is the least pertinent condition for experiment of any kind--sort of like the legion of scientists pulling salaries from R & D at Pfizer. Someone wise once described to me publishing and pharmaceuticals as similar industries because, like practically none other, the market price is established by the brand. We set the cover price, not "the market." Ambient Parking Lot, by Pamela Lu, has a premise that is theoretically indefensible and yet works for every reason; that is why it is like the internet: you never stop reading it. Propagation, by Laura Elrick, is the most prosodically satisfying series of poems I have ever read, and yet I was also able to publish it! PQRS, by Patrick Durgin, features Julietta Cheung's staged images of raw, processed meats.